A smart 360° photography turntable that can hold up to 400 lbs. Made in Canada, ORBOT helps create amazing videos of your products. 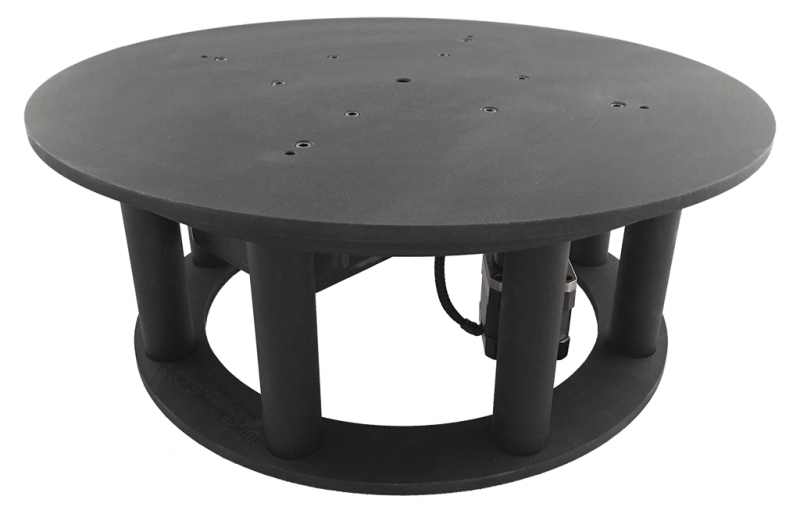 ORBOT is a computerized 360° photography turntable that can hold up to 400 lbs. Designed and manufactured in Canada, ORBOT helps create amazing videos of your products. Its smooth, computer-controlled movement makes it an essential tool for many different uses, including: photographers, videographers, 3D Imagers, Web animations and trade shows. Quiet – one 6-inch nylon gear and one 1-inch steel gear, only the motor is heard. Canadian – designed and manufactured in Montreal. 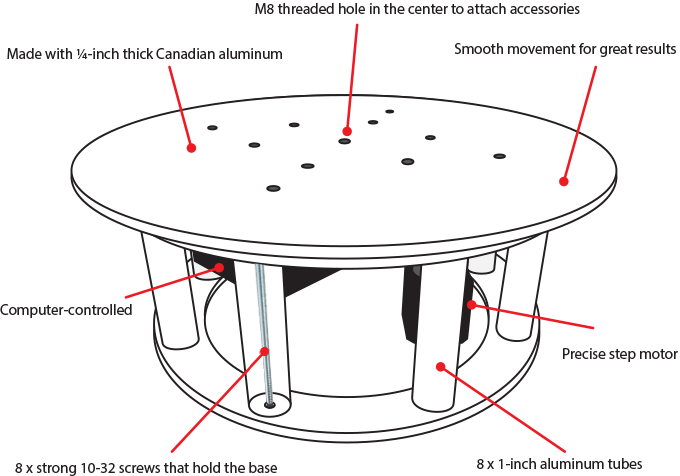 Large bearing – This allows you to put a non-centered weight on the table. Computerized – Controls the turntable via a computer like a robot. Simple to use – Just plug it in, install our software and start using the table. 400 lbs (181 kg) – Yes! You can put up to 400 lbs on the turntable. ORBOT is really tough! ORBOT includes a licence of our software TurnTable DX, a Microsoft Windows software that enables all features of our 360° photo turntable. ORBOT has been designed with three objectives in mind: robustness, precision and quiet operation. We are very proud to have achieved all our objectives. We added an M8 threaded hole in the center to attach accessories, like a clear acrylic pole and fittings for hanging small objects. Everything is screwed together with locking-bolt. You control the speed from 60 secs to 60 minutes for a 360° rotation. You can set rotation by angle (45°, 90°, 180°, 270° and 360°) or continuous rotation. You can also change the direction of rotation. 1067 – PhidgetStepper Bipolar HC, SDK is available for free if needed. ORBOT is so strong that it can take up to 400 lbs, even with off-centered objects. ORBOT is also perfect for rotating a person for Full Body 3D Scanning.